"I﻿﻿﻿﻿﻿﻿ took the time to research what you need to know on how to start college, apply for college financial aid, repay student loans & avoid default﻿. With ﻿10 instructional lessons over 3 hours, I am confident you will ﻿feel ﻿﻿empowered ﻿to tackle this﻿﻿ life﻿﻿ skill"﻿﻿﻿﻿﻿﻿﻿﻿﻿﻿. Lesson﻿﻿ ﻿﻿1: What is college? Less﻿o﻿n ﻿﻿﻿2: What is offered in college? 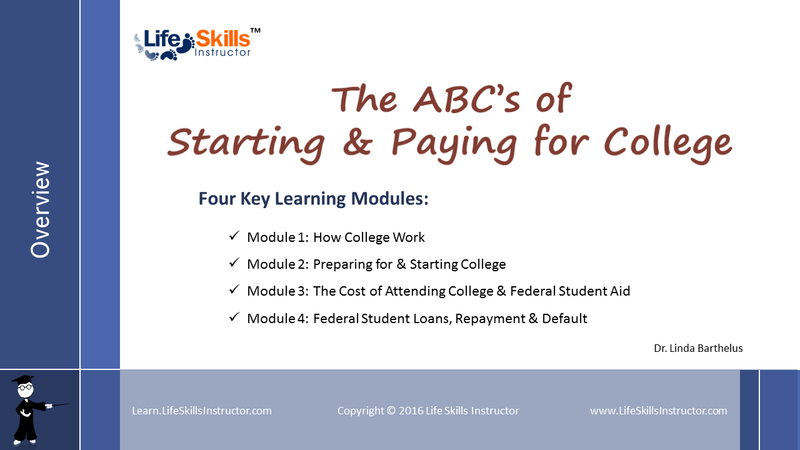 Lesson﻿﻿ ﻿﻿8: What are federal student loans? This life skill is very necessary for your adult life because attaining a college education is one way to help ensure a stable financial future. However, the choices you make during that period in your life can have long lasting effects... positive and/or negative. This course will help you in a way that is easy for you to understand so you can face this life skill with confidence and avoid costly mistakes. There are alot of information about college and how to pay for it online and via college representatives. We took the time to compile the most relevant information you need in your search for a college, how to pay for expenses, clear step by step on the federal student loan process, why to avoid private student loans & more...all in a concise and easy to understand format. Many former college students find themselves burden with student loan debt & future students are scared in of rising college costs...this course addresses those fears by providing specific instructions on the college preparation process, applying for federal student aid and repaying any student loans successfully. You get very specific guidance on how student loans work, both federal & private loans, the different terms & repayment plans available and if in default-how to get out. With solid knowledge on how to search for the college that best fits your needs, taking entrance exams or avoiding them, calculate tuition & other college expenses, keeping your costs of attendance low, borrowing & repaying student loans... you will feel confident to tackle all that college has to offer. Got the college course and its well worth it...will be starting college soon & the thought of student loan debt scared me...the course answered alot of questions I had- better than my high school counselor. Life Skills Instructor exists to offer real-life instruction in a convenient online platform to those who are moving into adulthood and need a bit of guidance along the way.